Gandhara was an ancient kingdom located in what is the region that is today northwestern Pakistan and northeastern Afghanistan. The history Gandhara can be traced all the way back to the Vedic period, when it was an independent kingdom. Subsequently, it was conquered by various powers, including the Achaemenid Empire, the Macedonian Empire, and the Mauryan Empire. It was due to Gandhara’s central geographical location, i.e. at the crossroads between India, Central Asia, and the Middle East, that it was targeted by so many conquerors. Nevertheless, it was also due to this factor that its greatest legacy, i.e. its art, was formed. The Gandhara region was occupied by human beings as early as the Stone Age. Evidence of this human presence is seen in artifacts such as stone tools and burnt bones that have been dated to about 15,000 years old. Fast forward to the Vedic period, Gandhara was a mahajanapada, i.e. one of the 16 important kingdoms / republics of ancient India. The kingdom is mentioned in both of the great Hindu epics, the Mahabharata and the Ramayana. According to the former, for instance, the Gandharans were supporters of the Kauravas, who fought against the Pandavas. The Gandharans are also recorded to have been highly skilled in the art of war. The Gandharans lost their independence after they were conquered by the Achaemenid Empire in the 6th century BC, either during the reign of Cyrus the Great or in the first year of Darius I. On the inscription of Darius’ tomb at Naqsh-e Rustam, near Persepolis, Gandhara is listed as one of the satrapies (governed province) under the Achaemenid Empire. Around 380 BC, the Persians began to lose their grip on Gandhara, and a number of smaller kingdoms began to emerge in the region. These states, however, were short-lived, as Gandhara would be conquered by Alexander the Great in 327 BC. Macedonian rule in Gandhara did not last for long and was conquered once more, this time by Chandragupta Maurya, the founder of the Mauryan Empire. According to tradition, Chandragupta Maurya lived in Taxila, the capital of Gandhara, when it was captured. Tradition also states that Gandhara served as Chandragupta Maurya’s base when he launched his campaign against Magadha, a dominant power in northern India at that time. Following the decline of the Mauryan Empire, its western frontier was open to invasion once more. Around 185 BC, Demetrius I, a Graeco-Bactrian ruler, conquered Gandhara. Graeco-Bactrian rule in Gandhara ended when the Kushans from Central Asia invaded the region. Subsequently, various groups, including the Sakas, the Parthians, and finally the Muslims under Mahmud of Ghazni, occupied Gandhara. It was after this final conquest that the name of Gandhara itself was lost. The greatest legacy left behind by the Gandharans is their art, which testifies to the location of the region at the crossroads of cultural influences coming from the East and the West. Gandhara first attained its role as an important cultural center in the 3 rd century BC, during the reign of Ashoka. During this period, Gandhara became a hub of Buddhist missionary activity. During the 1 st century AD, Gandhara was under the rule of the Kushans and this was considered to be its golden age. Buddhism flourished during this period and with it the arts. The Kushans were in contact with the Roman world and this is evident in the Buddhist sculptures that were being produced. For instance, many motifs from Roman art, such as vine scrolls, centaurs, and tritons, may be found in these sculptures. Moreover, the Buddha, despite being an Indian figure, was ‘Hellenised’. 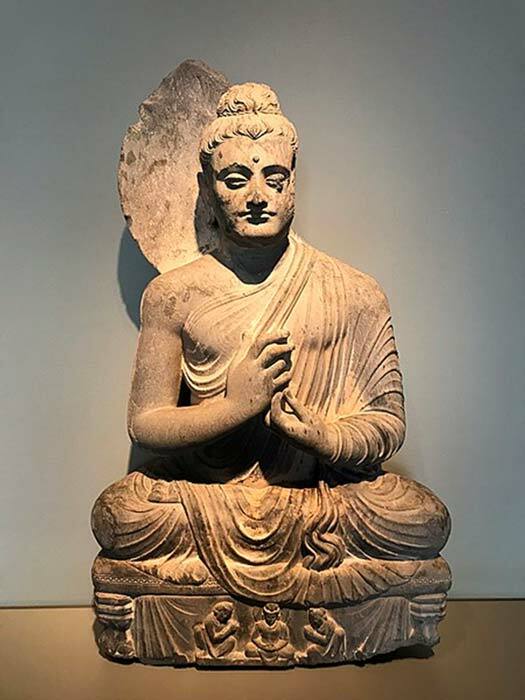 Standing sculptures of the Buddha from Gandhara are depicted with youthful faces and wearing garments reminiscent of those depicted on imperial Roman statues. Gandhara was re-discovered during the 19 th century. At that time, British soldiers and administrators were eager to retrace the steps of Alexander the Great in the Indian subcontinent, and therefore were exploring the region. The site of Taxila was identified by Alexander Cunningham during the 1860s, and many Gandharan statues were discovered in the region. Today, the works of the Gandharan sculptors are displayed in various museums around the world. 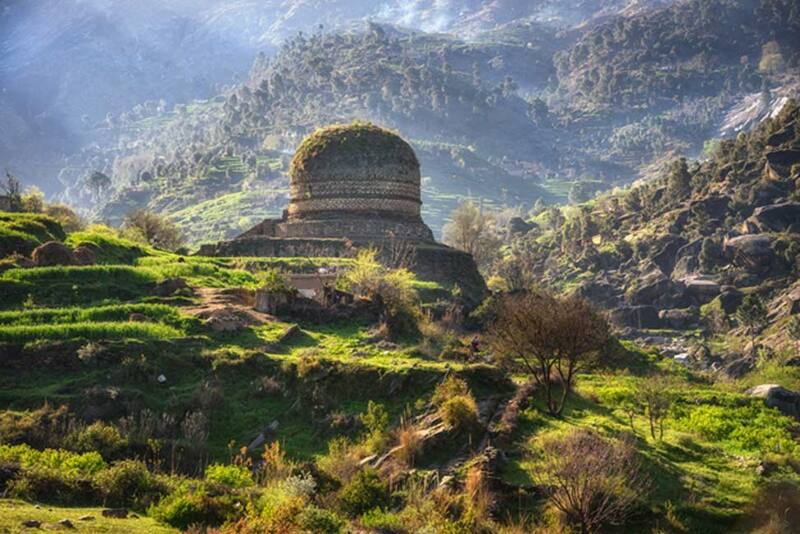 Top image: Buddhist Monastery Swat Pakistan. Source: SakhanPhotography / Adobe. "It was due to Gandhara’s central geographical location, i.e. at the crossroads between India, Central Asia, and the Middle East, that it was targeted by so many conquerors. " The region is also extremely rich in all kinds of minerals. Afghanistan's emeralds are the finest in the world.